We find very little in Scripture about little children. Most biblical stories speak about the adults in God’s plan of salvation. In some cases, like in the story of the feeding of the five thousand, Matthew writes: “And those who ate were about five thousand men, besides women and children” (Matt 14:21). The fact that children are not numbered here may indicate the little consideration they were given in society. Jesus, however, welcomes little children, lays hands on them, and goes so far as saying the kingdom of God belongs to those who are like them. Perhaps you have seen what often happens in a room with young children when you ask for a volunteer to lead prayer. Often, many hands go up. When they pray, they are not concerned about what someone else thinks; they simply talk to their Father in heaven. Getting adults to spontaneously lead prayer is not always easy. Adults tend to be concerned about having the right words, worrying what others may think. 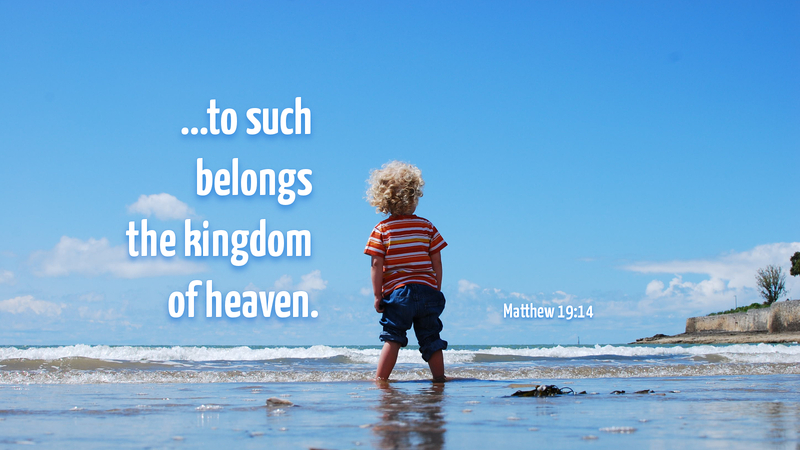 Could the Lord Jesus Christ be inviting us to return to the state of mind of young children whose prayer is not concerned about what others think but only about being in conversation with our Father in heaven? Prayer: Father in heaven, help me to be like little children who speak to you without worrying about what others think. Amen. I also believe that the key word here is “innocence.” Children, before they become hardened by the world we live in, are innocent and some actually stay that way longer than others. If our hearts could be like that of a child, open to the messages and truth of Christ, how much better a world we would live in.